Narcís Monturiol was an inventor. In 1829, when he was only ten, he built a wooden model of a clock. In his twenties he developed a cigarette rolling machine, a device for cutting and printing student notebooks, and some untested ideas for the fabrication of potato starch. But Monturiol’s ambitions were greater. He wanted to change the world. 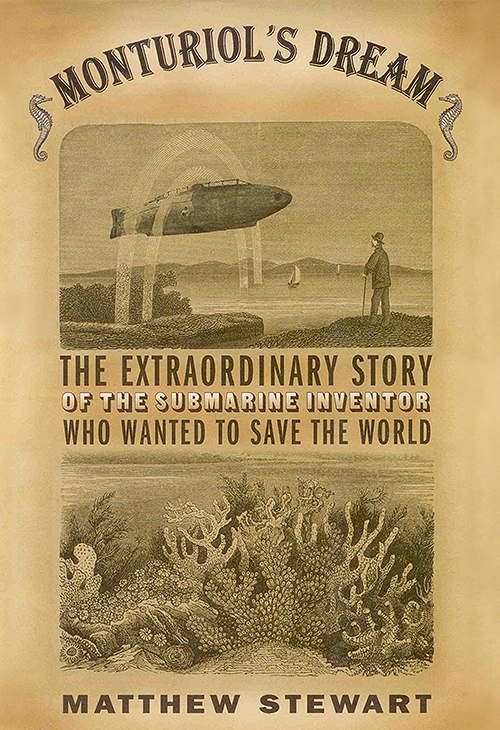 At the age of 37, after failed career as a utopian communist, this self-taught Leonardo began his great project: to build the world’s first-ever submarine. And his submarine was to be the first step in his plan for bringing about a better life here on land. In Monturiol’s Dream, Matthew Stewart tells, for the first time, his story – a moving tale of science, history, and human endeavor. Monturiol’s Dream is about much more than a submarine. Citing sources as diverse as Aristotle, Hegel, and Alexander von Humboldt, the famed nineteenth century naturalist, the book uses the remarkable and passionate life of Monturiol as the basis for reflections about the idea of progress, the nature of modernity, and the meaning of the inimitably human striving for an ideal world. “a fascinating and utterly delightful scientific history. “This is a gripping tale. Boys’ stuff, undoubtedly, but boys’ stuff with a conscience … The story romps along at a cracking pace. … What really makes Matthew Stewart’s biography … worth reading is the light it throws on the true motivation of engineers and scientists of every period.